Taylored Expressions Sneak Peek: Always & Forever! 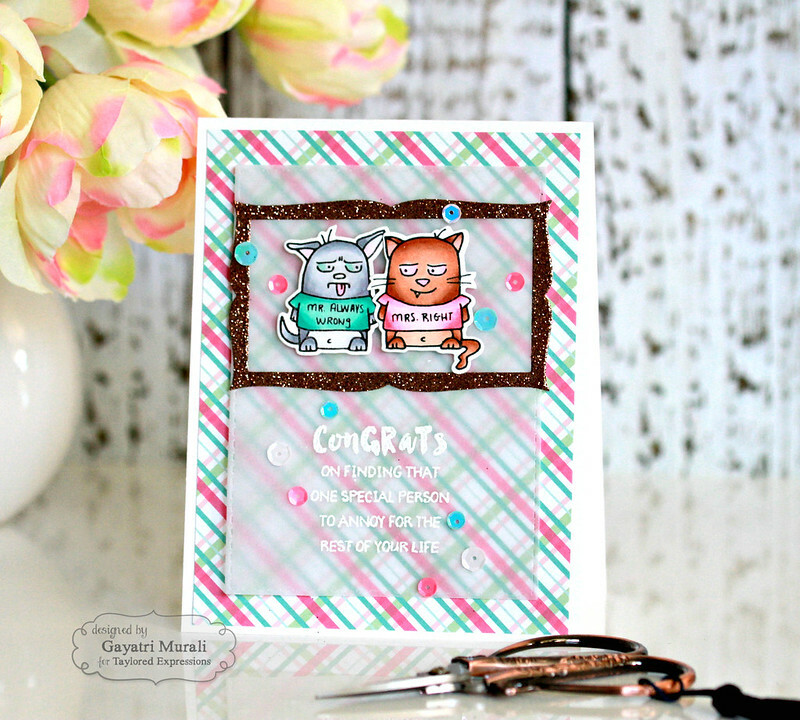 Today I am showcasing stamp set and dies from my favourite Grumplings series. This is a new one called Mr. & Mrs. Grumplings. I really love this set especially the sentiments. This set also comes with coordinating dies. I have couple of cards to share using this set and dies. To make this card, I started with stamping and colouring the Grumpling images with copic markers. Then I used the coordinating dies and die cut them out. For the background, I did some ink smooshing using Cracked Pistachio and Abandoned Coral distress inks on watercolour paper. I started with smooshing the inks in a colour wash which I dried using heat gun, then repeated the process with more ink adding layers. Once dry, I adhered the panel on the card base. The frame is diecut using Frame to Frame die also from Taylored Expressions and silver glitter paper. I adhered this frame using foam adhesives. then I adhered the Grumplings inside the frame again using foam for dimension. Sentiment is simply stamped on a strip of watercolour paper, trimmed and adhered. To finish off the card, I used sequins from Build a Scene also from Taylored Expressions LOVE the watercolour colour wash on the background. For the second card, I did the same process except changed the background. 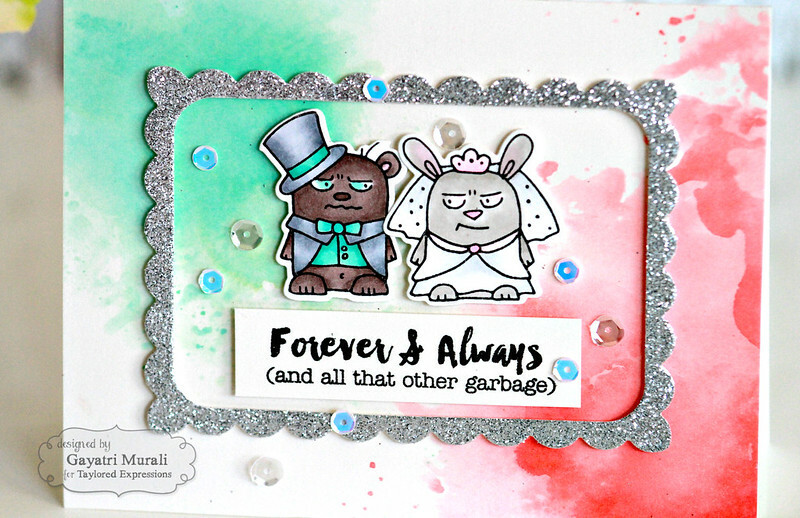 Again started with stamping, copic colouring and diecutting two more images from Mr. & Mrs. Grumplings stamp set. For the background, I used the plaid pattern paper from Double the Joy collection from Taylored Expressions. I layered the pattern paper with vellum panel die cut using die from Stitched Rectangle Stacklet. I white heat embossed the sentiment on the vellum panel.Then adhered the Grumpling images using foam adhesives. I felt the Grumplings needed to be framed. So I added a brown glitter paper die cut using one of the frame dies from Frame in Frame die set. Finally added sequins from Hello Happiness collection to bring the card together. 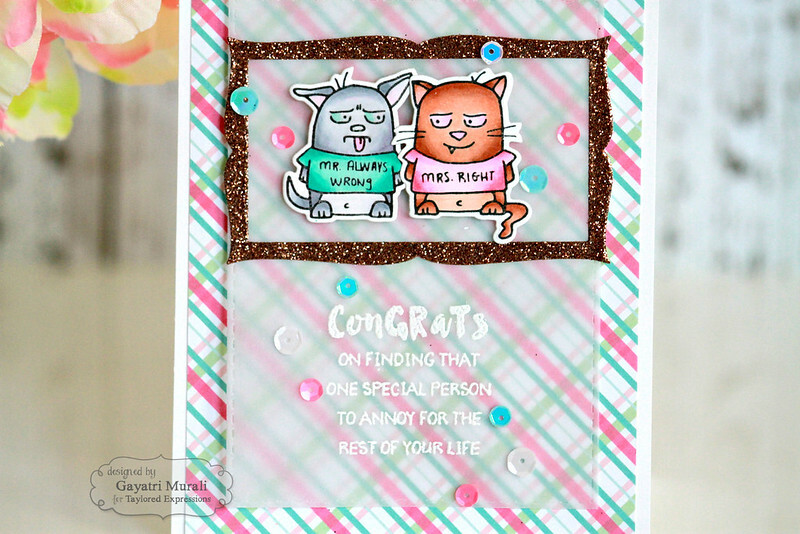 Hope you like both my card using Mr. & Mrs. Grumplings stamp set and coordinating die set. As I said the Grumplings series is my favourite. The sentiments and the grumplings always bring a huge smile to my face. I adore them 🙂 For more awesome design team inspirations from Day #1, please visit Taylored Expressions Blog. Good luck with your answer! Thanks for stopping by my blog today. A fantastic job on your cards Gayatri. The 2nd one is hilarious! LOL cute cards, especially the sentiments. Great colors and design. 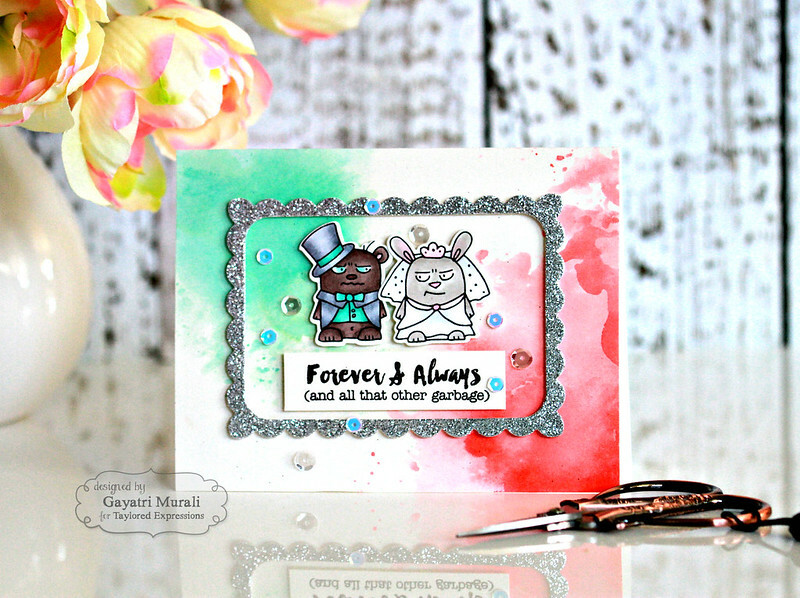 Wonderful cards, Gayatri! Love how you've framed the “happy” couples!